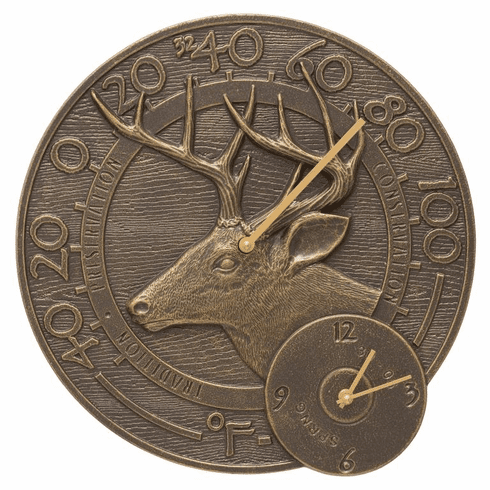 Whitetail Deer 14 inches Indoor Outdoor Wall Clock & Thermometer - French Bronze. The country/cottage style of the Whitetail Deer combination clock and thermometer will add a natural elegance to your outdoor living space. Features a hand made, premium grade aluminum casting that showcases an intricate, detailed design. High quality movement ensures accuracy. Manufactured in the United States from sand cast, high-density aluminum alloy. All Weather Coating and Aluminum shield coating -protect against the harshest weather and environmental elements. Extends the product life and maintains the look and function. Hand finished with a contrasting accent to complete this one-of-a-kind clock/thermometer. Made in USA.